After several stories and videos appeared online highlighting the huge number of motorcycle-related crimes, MCN spoke to the Metropolitan Police to find out what they're doing to tackle the epidemic. A spokesperson for the Metropolitan Police said the force are working hard to decrease motorcycle and moped-related crimes in London, after moped-related thefts rose by a staggering 600% in the last two years. Crime involving powered two wheelers is being targeted in Operation Venice, which tackles theft of mopeds, and moped related crime including the snatching of mobile phones and other personal belongings. Speaking to MCN, Mark Ottowell, Director or Media and Communication at the Metropolitan Police Service, said: "Operation Venice officers conduct targeted operations throughout London to prevent and detect moped theft. The operations include mass checks on stationary and moving powered two wheelers, raids on individuals suspected of stealing motorcycles and mopeds or using them to commit crimes, high visibility patrols in key areas, Automatic Number Plate Reader deployments and provision of free locks to owners at motorcycle parking bays. "Operation Venice also works with officers from Camden, Islington and City of London Police who use a range of intelligence-led policing tactics in order to tackle moped related crime. With a focus on safety, deterrence and intervention, officers have adopted both overt and covert methods to identify those people responsible, and, through a mix of judicial processes and education, reduce repeat offending whilst encouraging diversion through youth engagement. Officers patrol daily in cars and on motorcycles and bicycles, and a team of detectives conduct investigations and operations to tackle these and other crimes." The problem shows no signs of slowing at present, and with almost everybody now carrying a smartphone capable of recording video, more and more footage of motorcycle crimes is being posted online. In December 2016 a gang was caught on film attempting to steal a Ducati Panigale 1199S, although they failed to make away with the bike. In March this year, four thieves were filmed stealing a Yamaha R1 in a matter of seconds in the middle of a busy high street. And more videos and reports continue to surface. Hollywood actor Tom Hardy even got involved as he apprehended a thief that crashed a stolen scooter in April and just this week video surfaced of thieves assaulting a rider as they tried to steal her bike. - Parking: Choose designated parking with a stand and security loop, or if this is not available try areas with lots of people, good lighting and CCTV. - Locks: Use more than one lock, focusing on disc locks and chain locks, fitted tight to the bike and through difficult to remove parts. 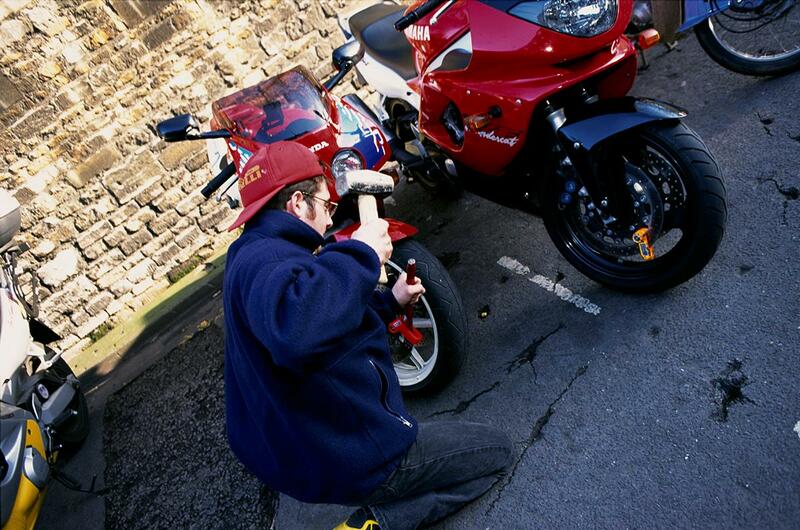 - Time: When leaving your bike for a long period or overnight, lock it to something secure and use a motorbike cover. At home consider using fitted anchors to secure your bike. - Attention: Use audible alarms where possible to draw unwanted attention to the thieves. - Marking: Choose to mark your bike parts with the vehicle identification number (VIN) number, your postcode or registration number using an ultraviolet marker pen or property marking kit. - Insurance: Some companies will offer discounts on your insurance if you invest in certain security measures, so ask before you make your purchase. Should you film a motorcycle theft if you witness one in progress? It's not a clear cut yes or no, but if you think filming will help identify the offenders and won't put yourself in danger that evidence will be passed on to Operation Venice officers: "If the public see any suspicious activity of have any information about who is committing these crimes please call police on 101 or Crimestoppers on 0800 555 111. All crime reports made by members of the public are passed on to the Operation Venice officers who will seek out offenders, based on information provided. "Information is key and members of the public are urged to pass on any information they may have around suspicious activity around mopeds and stolen phones to police, but would also urge that members of the public do not put themselves in danger." Are motorcycle crime figures levelling out? The Metropolitan Police have reportedly stemmed the number of scooter-related crimes in London.